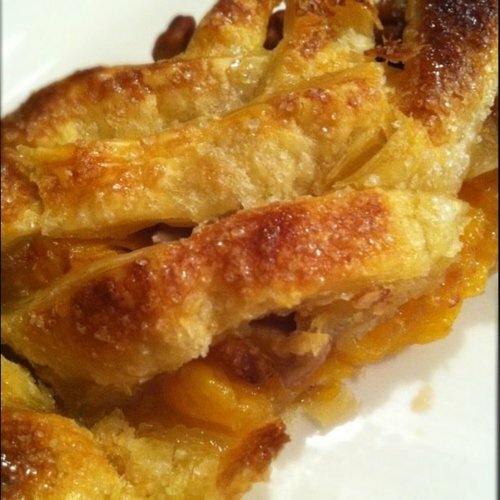 I am preparing to make a peach strudel with phyllo dough but have a question on how to put it together. I have noticed that some strudels have the filling spread throughout the entire sheet and some clumped together in one row on the sheet. Would it make a difference if I am using phyllo dough instead of a thicker puff pastry? I really like the presentation of the roll when the filling is applied throughout the entire sheet, but am afraid that it would be too mushy with layers of phyllo in the middle. Any thoughts? 1. Dry out the Phyllo even more by layering and brushing with butter and a generous dusting of ground pecans or Biscotti (if you need nut-free). 2. Eight-layers of Phyllo, brushed with butter and topped with a thin layer of Genoise (vanilla sponge cake) to get the Swiss Roll/Strudel effect. Either way, you will achieve the crispness of Phyllo on the outside. With the Genoise method, the cake will absorb the moistness of the peaches and will not be mushy. I have never prepared this either, but food science dictates this should work. Please let me know!